S-110PP-S1SC20D-XT - 10/100 Fast Ethernet Stand-Alone Industrial Temperature Media Rate Converter with PoE+ ( PoEP ) Power Sourcing. 10/100Base-TX (RJ-45) [100 m/328 ft.] to 100Base-BX 1550nm TX / 1310nm RX single strand fiber, single mode (SC) [20 km/12.4 miles]. Extended Temperature, terminal block power connector for external power source. S-110PP-S1SC20D-XT 10/100Base Industrial Temperature Media and Rate Converter with PoE+ ( PoEP ) Power Sourcing. 10/100Base-TX (RJ-45) [100 m/328 ft.] to 100Base-BX 1550nm TX / 1310nm RX single strand fiber, single mode (SC) [20 km/12.4 miles]. Extended Temperature, terminal block power connector for external power source. These Industrial Converters are specifically designed for extended temperature operating environments of -40F to 167F ( -40C to 75C ). 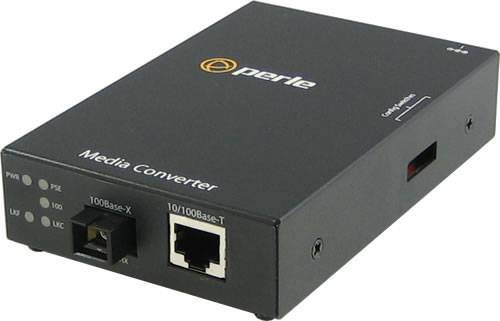 Fully compliant to IEEE 802.3, Perle PoE+ Media Converters are classified as Power Sourcing Equipment (PSE) classified as Power Sourcing Equipment (PSE) to provide up to 30 watts of power to PoE+ compliant devices such as IP cameras, VoIP phones and wireless access points. For complete product details and technical specifications, please visit our S-110PP-XT 10/100 Industrial Temperature PoE+ Media Converter Product Page.